Singer-songwriter Jason Mraz release his debut album an incredible 16 years ago. Waiting For My Rocket to Come arrived in 2002 and it marked the start of his rise to international stardom. 2008’s I’m Yours catapulted him into a global star and since then he’s been a consistent performer on the charts. Four years have passed since the release of his last album Yes! and now he’s back with sixth studio album Know. Mraz teased the release of Know. with lead single Have It All. The optimistic and upbeat track was inspired by a conversation he had with a Buddhist monk in 2012. It’s the perfect embodiment of the positivity that Mraz infuses much of his music with and it’s a catchy way to draw his fans back in. With a sing-along chorus, the song stands with his best work and it’s a solid introduction to Know. The theme for Know. is optimism and hope. It’s a message so many of us desperately need in these dark and difficult times. With so much uncertainty in the world right now, Know. arrives at the perfect time. Through its 10 songs Mraz explores the power of love, the benefits of being positive and celebrates choosing human connection in an age consumed by digital devices. Opening with Let’s See What the Night Can Do, Mraz implores a lover to spend a night with him and see what happens between them. It has a soaring mid-section that underpins the honest lyrics. Elsewhere on the record Mraz nods back to Waiting For My Rocket to Come on the rap-pop of Unlonely, teams up with Meghan Trainor on the breezy More Than Friends, and he laments on the loss of a relationship on the emotive Sleeping to Dream. 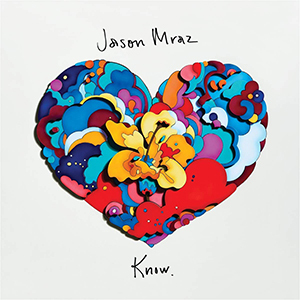 Might As Well Dance, a song that strays into Country territory, is one of the more experimental moments on the record and it’s a refreshing change for Mraz. The strongest moment on the record is one of the barest, Better With You. The track begins with Mraz singing only accompanied by ukulele as he admits that his life is better with his significant other in it. It’s a beautiful sentiment and another very honest moment on the record. Know. ends with Love is Still the Answer and it’s a powerful way to close the record. Mraz told me when I spoke to him earlier in the year that he firmly believes in these troubled times that love is the answer to many of the problems we face. While packing a poignant message, the song is also likely to strike a chord with couples trying to pick their first dance song. With Know. Mraz has lovingly looked back at where he came from musically and continued to progress his sound. It’s nice to hear the more playful side of his talents coming out again but he’s also a master of the soaring folk-pop hybrid that’s likely to strike a chord with millions. Know. is Mraz’s best album in recent memory and its positive message is one that we should all embrace and enjoy.